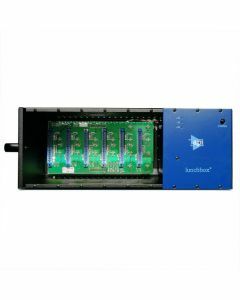 The API 500-6B lunchbox is a 6-slot rack designed to accept all API standard 5.25" X 1.5" modules. This quality allows an engineer the flexibility to bring along specialized EQ effects to any situation: 550A, 550b or 560. The lunchbox is self-powered with a rear panel selected AC voltage switch and a removable power cord. The input/output jacks are XLR. The lunchbox comes standard with a +48 volt internal phantom power supply, bussed to pin 15 for interface with the API 512c Mic Preamplifier. API makes several modules for the 500-6B, including the 512c Mic Preamplifier, the 525 Compressor, the 527 Compressor, the 550A 3-band EQ, the 550b 4-band EQ and the 560 Graphic EQ. Combinations of these modules make perfect stereo recording packages (two 512cs and two 550bs) or vocalist's box (one 512c, two EQs and one 527).